From Quebec, Canada in a little town named Massueville. WHATS YOUR PATH IN FISHING? HOW DID YOU GET INTO FISHING? My friends got me into fishing probably 11-12 years ago. WHAT PUSH YOU INTO SWIMBAITING AND WHEN? Catching big fish is what every fishermen wants and swimbaits seemed to be the best way of doing it. I have been fishing swimbaits for about 5 years now. WHAT DO YOU LIKE ABOUT SWIMBAITING? Targeting the big one and catching above average fish. WHAT ARE SOME OF YOUR BEST FISH USING SWIMBAITS? Most of the big fish that i've caught came on a S-Waver 200. 50” class musky , a 27” and 29” walleye. I have caught a lot of 4+ bass on the 168 too. WHATS YOUR FAVORITE TECHNIC AND WHY? Glide baits are my favorite, you often see the strike, they follow and hit at the boat, catches are always spectacular with them. WHEN CAN YOU FISH FOR BASS IN QUEBEC, HOW DO YOU ADAPT IN WINTER? Bass fishing season is pretty short for sure, mid June to Late November, in winter I just try to survive. Tuning, tweaking baits and buying new ones is what I do in winter. THUS FAR WHATS THE BEST FISHING TRIP YOU'VE HAD? Our recent trip to the Beauchene wilderness lodge was the best fishing experience I ever had. 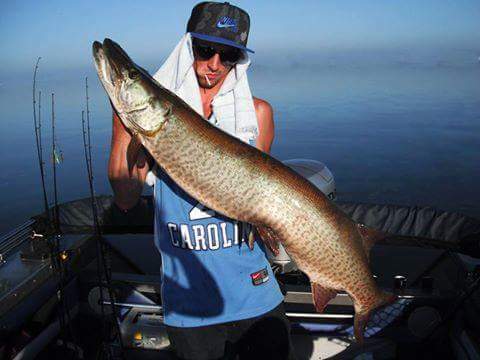 WHATS YOUR GOAL FISHING RELATED, FISH YOU WANT TO CATCH? I would like to catch a 6 lbs+ on a glidebait, small or large mouth bass.